On Russia Meddling in US Election, Where Do Trump and US Intel Community Stand? U.S. President Donald Trump and Russia's President Vladimir Putin talk during a photo session at the APEC Summit in Danang, Vietnam, Nov. 11, 2017. The issue of Russian meddling in the 2016 U.S. presidential election followed President Donald Trump on his 12-day trip through five Asian nations. Trump went on to say, “That whole thing was set up by the Democrats” — slamming former United States intelligence leaders, including former CIA chief John Brennan and former Director of National Intelligence James Clapper. “They're political hacks. So you look at it, and then you have Brennan, you have Clapper and you have (James) Comey. Comey’s proven now to be a liar and he’s proven to be a leaker,” he said on route to Hanoi, referring to the FBI's former director, who was fired early in Trump’s presidency amid much controversy. “So you look at that. And you have President Putin very strongly, vehemently says he had nothing to do with that,” Trump said. Sen. John McCain, R-Ariz., talks to reporters on Capitol Hill in Washington, Wednesday, Oct. 18, 2017. The remarks drew rebuke from former U.S. intelligence officials and top U.S. lawmakers, including former Republican presidential candidate, Senator John McCain. “There’s nothing ‘America First' about taking the word of a KGB colonel over that of the American intelligence community ... Vladimir Putin does not have America’s interests at heart. 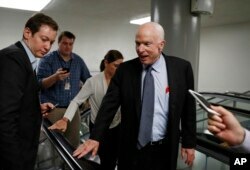 To believe otherwise is not only naive but also places our national security at risk,” McCain said in a statement. On Sunday, Trump said he was surprised by the criticism and tried to clarify his remarks on Putin, when questioned by reporters during a press conference in Hanoi. Current U.S. intelligence officials declined to comment on Trump’s remarks Saturday, but continue to stand by the community’s January 2017 assessment, which determined that Putin had “ordered an influence campaign in 2016 aimed at the U.S. presidential election." A U.S. intelligence official told VOA there has been no change to the assessment about Russia’s efforts to influence last year's election. 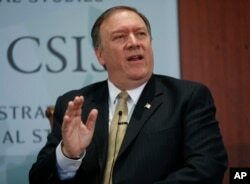 CIA Director Mike Pompeo answers questions at the Center for Strategic and International Studies (CSIS) in Washington, April 13, 2017. At the same forum, CIA Director Mike Pompeo was asked whether Russia intervened in the 2016 election. Last month at the FDD’s (Foundation for Defense of Democracies) National Security Summit in Washington, the CIA director was criticized for saying U.S. intelligence agencies had determined that Russian meddling did not sway the election. The issue is that the intelligence community never made an assessment of how Russian meddling, including the hacking of Democratic National Committee computers and subsequent dissemination of emails from key staffers, may have affected the election. From left, Facebook general counsel Colin Stretch, Twitter acting general counsel Sean Edgett and Google information security director Richard Salgado arrive for a Senate panel's hearing on Capitol Hill in Washington, Oct. 31, 2017. Recently, U.S. lawmakers questioned representatives of tech giants Facebook, Twitter and Google about Russia's use of their social media platforms to spread disinformation during last year’s presidential campaign. Twitter says it was able to identify around 36,000 automated “bot” accounts that could be linked to Russia. The Russian meddling campaign on Facebook comprised approximately $100,000 spent by “fake accounts associated with the IRA” on 3,000 ads between June 2015 and August 2017, according to Facebook lawyer Colin Stretch. The Internet Research Agency has been described as a Russian troll farm. VOA' s National Security Correspondent Jeff Seldin contributed to this report.